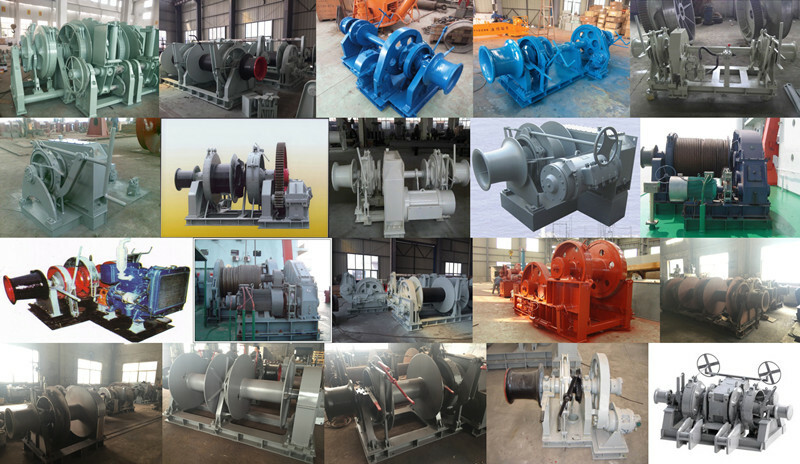 Product categories of Anchor Windlass, we are specialized manufacturers from China, Marine Anchor Windlass, Ship Anchor Windlass suppliers/factory, wholesale high-quality products of High Quality Anchor Windlass R & D and manufacturing, we have the perfect after-sales service and technical support. Look forward to your cooperation! 2), the anchor rating should be not less than 41.68d2N (4.25d2kgf), when the d<25mm rating should not be less than 36.8d2N (3.75d2dgf), D for the chain diameter, the unit is mm. The average speed should be no less than 9m/min when the rated tension is used. 3) anchor machine under rated tension and speed should be continuous 30min, and should be continuous work in not less than 1.5 times of the rated tension overload tension under 2min; in addition to anchor machine should be equipped with overload protection device, overload can be transferred to the medium speed operation. 4), anchor chain sprocket on the brake should be reliable, 45 per cent of the brake chain fracture load pull (when freedom anchor at speeds of up to 5~7.5m/s can still stopped on the outskirts of falling chain); between the anchor machine chain wheel and axle load should be a clutch, brake and clutch manipulation is convenient and reliable; anchor machine operation should be along the reverse rotation and smoothly and rapidly. 5) anchor machine installation shall ensure the cable leads three eyes (hawsepipe, chain, sprocket and line). Anchor machine is mainly by the base, a bracket, a chain wheel, brakes, sprocket, gear box, control system (manual windlasses except and other components, electric windlass motor and hydraulic windlass with hydraulic pump station. The main specifications of the windlass include diameter of anchor chain, anchor nominal speed, rated load, support load, speed, power system etc.. The type of anchor windlass can be divided into 12-- Phi Phi 120mm several kinds of specifications in accordance with the diameter of anchor chain. According to the driving mechanism of energy points --- manual windlass, anchor steam machine, electric anchor machine (DC electric windlass, AC electric anchor machine) and hydraulic windlass (high pressure type anchor hydraulic machine, pressure type anchor hydraulic machine, pressure type anchor hydraulic machine. The weight does not exceed 250kg of the anchor, according to the working conditions, if it can be suitable for use, you can configure the manual anchor. Manual anchor machine is only used in inland river small ship, it should prevent the handle from injuring people. Steam windlass has been widely applied in the steam ship, currently used for large tankers. The firm structure, reliable work, no dangers caused by fire, but the steam engine efficiency low, huge structure, laying on the deck for a long pipeline heat loss, deck steam engine cylinder pressure is generally not more than 0.8MPa, operation management problems, in Yan Hanji day when the weather is cold, before use to fully warm engine, to discharge the residual water. Electric anchor machine is currently the most widely used in the ship. According to the power system of the ship, the electric anchor machine has DC motor and AC. DC motor speed control characteristics, high efficiency, but the high cost of the initial set, the brush should be regularly maintained. AC motor speed adjustment performance is poor, usually only have a variable speed, depending on the pole or by the motor and the anchor of a set of speed reducer to get a number of speed grades. This set of gear reducer, due to the need of a large reduction ratio, and consider the transmission and the reliability of the work of the anchor and other issues, the structure is more complex, the weight and size of the area occupied by the larger deck. Reducer transmission device often used spherical worm and worm gear transmission, spur gear transmission, planetary gear transmission and other transmission mode. Generally speaking, the planetary gear reduction gear transmission mechanism of light weight, small size, high transmission efficiency, maintenance is simple, so the current application more. (1) with a good speed control performance of the DC motor. (2) usually uses the low speed high torque hydraulic motor, low speed, large output torque, no longer need to set up a huge mechanical reducer, can directly drive a chain wheel. (3) hydraulic drive with self made dynamic performance, work safety and reliability. (4) compact structure, small weight and size of unit power. .
(5) easy to operate, maintenance is simple.